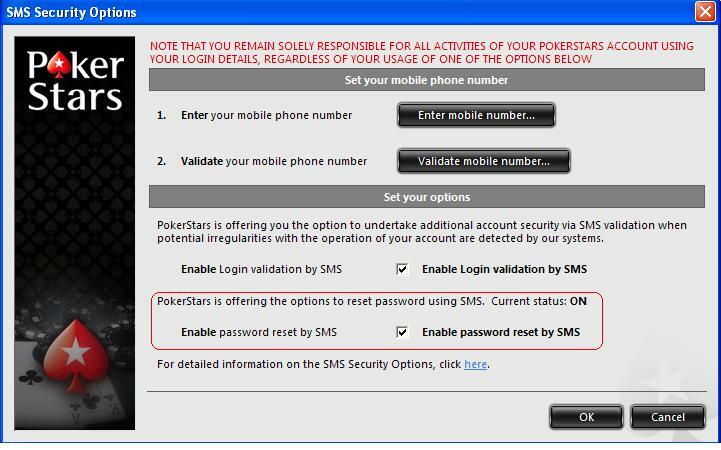 The award-winning PokerStars software is the safest online, and now you can increase the security of your player account by using “SMS Validation”. When activated, you will receive a SMS text message with a secret code when potential irregularities with the operation of your PokerStars account are detected by PokerStars systems. The ability to conduct real money transactions (including deposit, cash out, transfer, tournament registrations and cash games play) will be suspended until you enter the secret code (that was sent by SMS text message) into the PokerStars software when prompted. This service is free to all users, and adds an additional security mechanism to ensure that PokerStars player accounts remain safe and secure against different online threats. How do I register a mobile phone number on my account? Log into the PokerStars software. Choose the country of your mobile phone number, and type your phone number into the relevant box. Please do not include any zeros at the beginning of the number. Wait to receive the SMS Validation Code on your mobile phone and type it in the SMS Validation Code dialog box. Check the ‘Enable Login validation by SMS’ checkbox. Follow the prompts to complete the setup. If you do not currently have a mobile phone number registered on your account, you will be prompted to provide a mobile phone number as described above. How do I remove SMS Validation on my account? Why can I not register a mobile phone? Initially, the SMS Validation feature will be available only to accounts registered in select countries, and will be deployed globally once PokerStars has ensured that it meets customer expectations. How does the PokerStars server detect ‘potential irregularities’? What happens when potential irregularities are detected? When suspicious activity is detected, your account’s ability to make real money transactions will be suspended. This means that your account will not be able to make deposits, withdrawals, real money transfers, register for tournaments or play in cash games. Further, your account will be unable to make changes to login security settings (e.g removal of the SMS validation feature, PIN or RSA) or other sensitive account details. These restrictions will apply until you enter the code sent to you via SMS text message in the PokerStars Software. You will continue to be able to play in tournaments that you have already registered for - this ensures that you do not lose any buy-ins that you have already paid. I have accidentally triggered this feature, yet I have lost access to my mobile phone. What should I do? Please email security@pokerstarscasino.eu so that our staff can assist you in restoring access to your account. In the mean time, you can continue to log in to the PokerStars software and play in any tournaments that you have already registered for. Will using SMS Validation make my account completely secure? The use of SMS Validation can enhance your PokerStars account security and reduce the risk of key loggers, phishing attacks, and make it much harder for unauthorised hackers to access your PokerStars account. However no single feature in itself can completely eliminate the risk involved. SMS Validation helps to reduce the risk of hackers obtaining access to your PokerStars account, and can be an important part of a comprehensive security strategy. PokerStars recommends that you also consider obtaining a Security Token from the PokerStars VIP Store for additional account security protection. Can I share SMS Validation with a friend? Each mobile phone can be registered to only one PokerStars account. Consequently, you will need a separate mobile phone for each PokerStars account. This includes if you have PokerStars accounts on multiple PokerStars platforms. Will I incur any costs if I opt in for SMS Validation? PokerStars does not apply any charges for using the SMS validation service. Please note however you may incur SMS charges dependant on your agreement with your mobile network operator. If in doubt, please check with your mobile network operator. I have opted in for SMS validation and but I am not receiving your codes. Your mobile provider might block you from receiving SMS messages from PokerStars. Please contact your mobile network operator for further assistance. How quickly will I receive my validation code? SMS delivery times are dependent upon network availability, location, handset configuration, and mobile network operator arrangements. Please contact your mobile network operator for further assistance. How do I enable/disable the ‘SMS Password Reset’ feature on my account? If you do not currently have a mobile phone number registered on your account, you will be prompted to provide a mobile phone number as described above. Why should I opt in to the ‘Password reset by SMS’ feature? The ‘Enable password reset by SMS’ functionality does not appear under the SMS Security Options menu. Why? First and foremost ensure you are logged in and that you are not trying to activate the feature via the PokerStars Mobile software. Additionally, the SMS password reset feature will be available only to select accounts in various jurisdictions and will be deployed globally once PokerStars has ensured that it meets customer expectations. I have activated the SMS password feature in the past, but I am no longer being given the option to reset my password via SMS. Why? The SMS password reset feature is only available to accounts with specific characteristics. If this option is not available to you it means that your account no longer meets the eligibility criteria for the feature and you will need to reset your password via email. I do not have access to my registered mobile phone number and I require a new password? You can select to have the new password delivered to your registered email address. Simply select the E-mail option when prompted. Remember to update or remove your mobile phone number once you have logged in.